An elderly parishioner has stunned Spanish cultural officials with an alarming and unauthorized attempt to restore a prized Jesus Christ fresco. 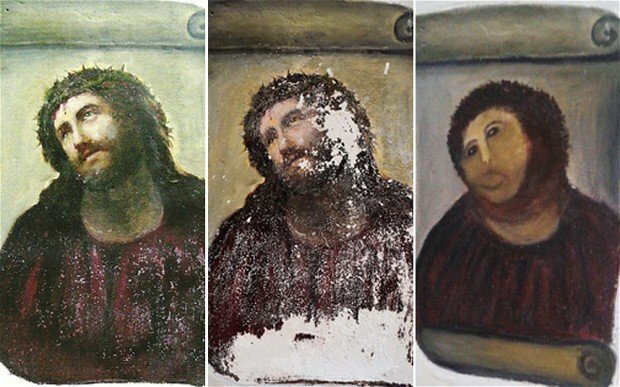 The woman, in her 80s, was reportedly upset at the way the fresco had deteriorated and took it on herself to “restore” the image. The delicate brush strokes of Elias Garcia Martinez have been buried under a haphazard splattering of paint. The once-dignified portrait now resembles a crayon sketch of a very hairy monkey in an ill-fitting tunic. The woman appears to have realized she was out of her depth and contacted Juan Maria Ojeda, the city councilor in charge of cultural affairs. Juan Maria Ojeda said: “I think she had good intentions. Next week she will meet with a repairer and explain what kind of materials she used. To make matters worse, the local centre that works to preserve artworks had just received a donation from the painter’s granddaughter which they had planned to use to restore the original fresco.